Blundering ‘daredevilry’ at Britain’s nuclear submarine base exposed up to 20 workers to radiation, according to a Ministry of Defence (MoD) report. 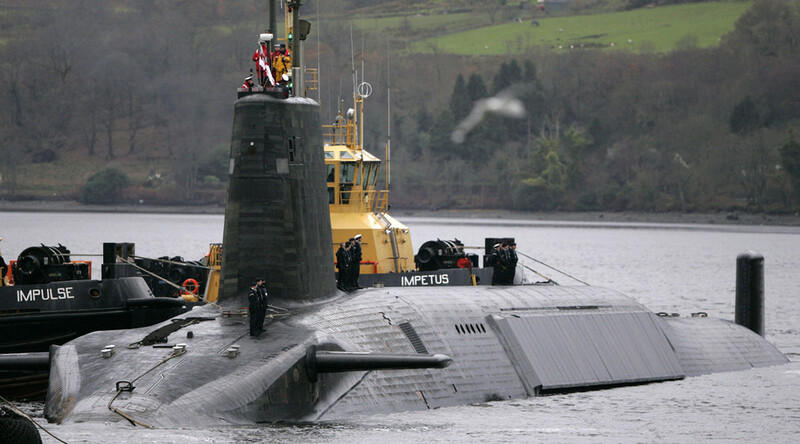 The incidents, which were investigated by the Ferret website, took place aboard nuclear submarines docked at the Faslane naval port in Scotland. The MoD’s report covered four incidents between 2012 and 2013. It took the military two years to release the heavily redacted documents following Freedom of Information (FoI) requests. One incident in August 2012 saw 20 contractors working for the defense firm Babcock exposed to radiation while repairing a leaking tank on a Trident submarine. It transpired that a reactor close to the workers had been in operation for a period of 24 hours while repairs were underway. According to one of the MoD reports the team leader asked about safety but was wrongly advised by the navy that the level of exposure fell within acceptable limits. “Babcock employees were inside the tank for more than 24 hours with no controlled area established, no approved dosimetry and no other radiological control in place,” it concluded. In April 2012, a group of inspectors visited a submarine without the necessary radiation badges, which measure exposure to ionizing effects. In December 2013, a worker was irradiated after opening an inspection panel, and in February of the same year an irradiated sponge was mistakenly carried into an office by a sailor. “To have allowed these workers to have entered a tank connected to the nuclear reactor whilst it was under criticality operation was daredevilry and an absolute disregard of the most common sense and obvious radiological safety protocols,” Large said. A MoD spokesperson said that none of the incidents had resulted in harm to staff or the public and that the incident had been fully investigated with a view to preventing similar incidents in the future. “We continue to conduct rigorous monitoring as part of our commitment to maintain the highest standards,” the MoD added.